With a couple of tropically-themed bars already running rum straight into the veins of this Irish whiskey town (and a couple more slated to open later this year), it’s pretty clear that Tiki Tuesdays were never going to cut it around here. Bostonians can’t seem to get enough of pretending they’re drinking somewhere else (especially in a place that doesn’t get its fair share of sunshine), and Tiki bars represent escapist imbibing at its finest. They date all the way back to the 1930s, when Donn Beach and Trader Vic took some serious creative license with Polynesian culture to transport war-weary diners from their California restaurants to a torch-lit tropical paradise. Step inside, dive into an umbrella-topped concoction, and the troubles of postwar (or post-work) life seem to disappear into the palm trees. But while a well-made Mai Tai or Painkiller can be truly sublime, Tiki menus typically revolve around the same well-worn spirits and tropical buzzwords, rotating through variations on cocktails we’ve all tried before. And isn’t the point of a fantasy menu to venture into uncharted waters? The Tiger Mama team certainly thinks so. 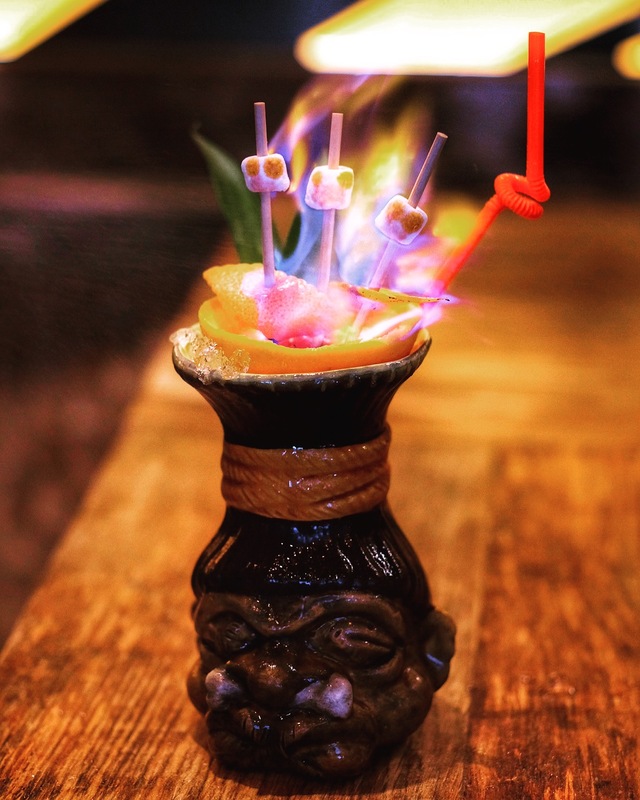 The Fenway’s own Southeast Asian oasis has a Tiki bar hidden in the back (if you haven’t, go), and their first menu delighted snow-booted Bostonians with freshly macheted coconuts and flaming garnishes rooted in the Pacific’s familiar Tiki territory. 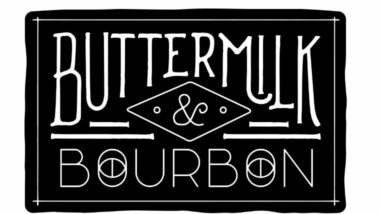 But for their second venture, Bar Manager Brian Callahan wanted to see what the other six seas had to offer, which is why Tiger Mama Volume II: A World Awaits, is a world-class cocktail menu in every sense of the term. So rather than kicking around the same old islands, the Tiger Mama bar crew has set sail for new horizons, gathering strange and delicious ingredients and a few incredible tales from foreign lands across the globe. 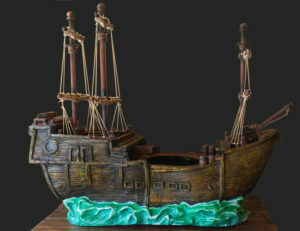 The menu features eleven cocktails, each inspired by a different part of the world or historical event, ranging from seafaring explorations to ancient bloody massacres. Take the Speaking in Tongues, a cocktail inspired by Callahan’s research on Mesopotamian ingredients. “Despite the fact that it couldn’t seem farther away from a tropical paradise, it shared a lot of ingredients commonly associated with Tiki.” Pomegranate, the base for grenadine, is a desert delicacy, and native pistachios find their way into the drink via a house-made orgeat. It’s all brought together by Baharat, a Middle Eastern spice mix with whispers of Tiki influence like allspice, cinnamon, and clove. Order up a Blood of the Saxon Men (if you dare) and you’ll find yourself on the battlefields of ancient Germany, where Charlemagne ordered the death of 4500 men during the Massacre of Verden. This riff ramps up the Zombie’s traditional spice and rum notes with almond and blood-red raspberries, and is gruesomely garnished with helpless, delicious little marshmallows that are skewered and burned at the toothpick. Japan is an island with plenty of cocktail clout, but it’s not usually associated with Tiki. Travel there with a Ballad of the Wind Fish, made with Japanese gin and a Hitachino white ale reduction accompanied by peach, ginger, and sesame oil. 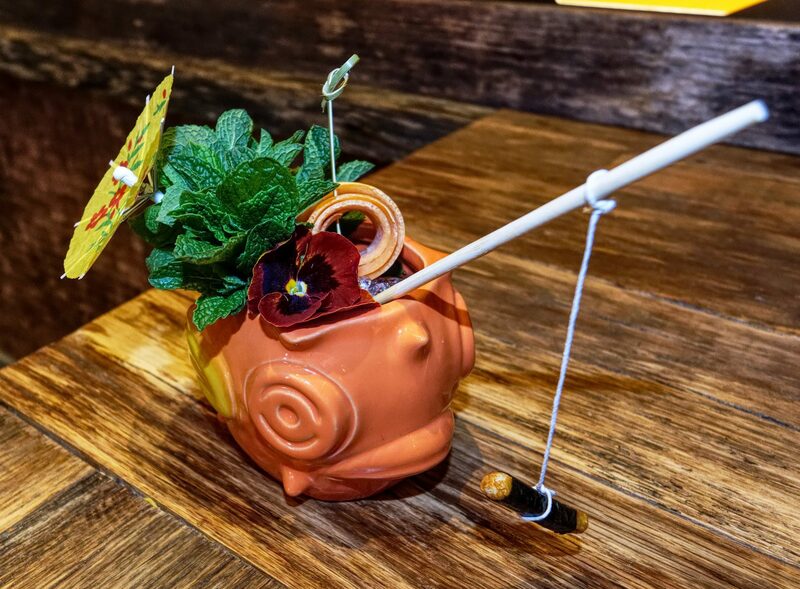 The drink is served in a fish (duh), and the elaborate homage is made complete with a nori-wrapped rice cracker tied to a chopstick to resemble a fishing line. 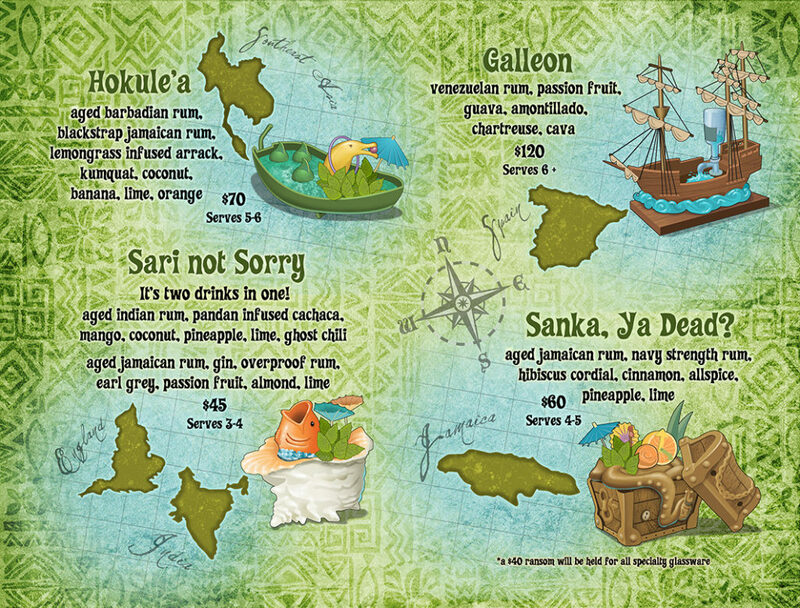 If you’ve come ashore with other thirsty explorers, the menu’s four shareable cocktails are just as intricate and inspired as their single-serving counterparts. 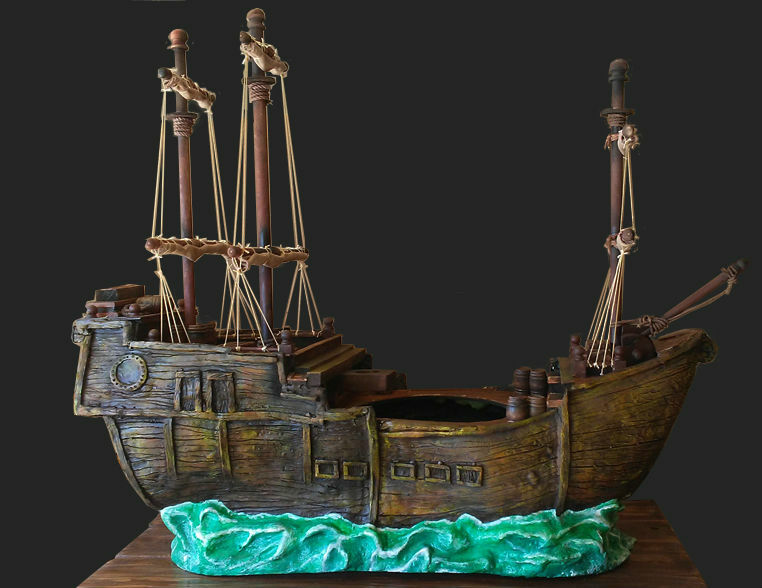 The most imposing is the Galleon, named for the pride of the Spanish navy and served in a custom-built galleon ship. The drink serves six or more brave souls, boasting Venezuelan rum, passion fruit, amontillado sherry, Chartreuse, and an entire sunken bottle of Cava. Read further and you might find yourself wandering through a Dio de los Muertos parade in Mexico or traveling along the ancient Silk Road in Italy. But no more spoilers. This globe-trotting project was a long time in the making, with custom artwork by Doug Horne in California, Tiger Mama Zombie glasses designed by renowned Japanese Tiki artist Mookie Sato, and specially designed vessels for most of the drinks. Callahan is planning on a mid-October rollout, so keep a compass handy and your passport at the ready. A world of drinking awaits.